Chelsea are prepared to accept any serious offers for their 33 year old striker Didier Drogba, who has close to 100 league goals for the West London club. The former Marseille striker has been at Chelsea since 2004 but with new January signing Fernando Torres likely to spearhead the new campaign, backed up by probable newcomer Belgian Romelu Lukaku, Chelsea will accept serious bids as they look to compact the squad. 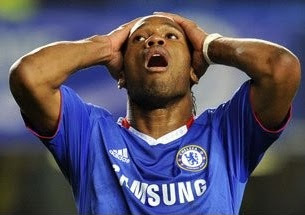 However, should Guus Hiddink agree to become the Blues’ new manager, it is likely that Drogba could be offered a contract extension with the current Turkey manager a known admirer of the forward and it being known that Hiddink would rather use him than have to face him during possible Champions League clashes. Drogba has been linked with a move back to Marseille, with Manchester City and Tottenham Hotspur apparently also keen and it has been mentioned that the Blues would prefer to sell than risk Drogba causing a rift within the dressing room by replaced by Torres as first choice striker.